Here is my completed (almost) English style woodworking bench. It’s southern yellow pine with walnut dowels (Miller 2X) finished with boiled linseed oil. The top is 2.5 inches thick. It weighs a ton and it’s rock solid. I put virgin rubber treads (made from the soft material used under rugs to keep them from sliding on hardwood floors) under the legs so it won’t slide on the smooth floor. I’ll have to add a leg vise and an end vise and drill a series of holes in the top and apron sections for some forged iron holdfasts. I hope no one gets in a snit because I have things to add still. I am very happy with the results and may not be able to purchase the vise hardware fo a while. For now, I will have a very solid bench for upcoming projects. Hey Tim, looks like a great working work bench. Is that from Paul Sellers book? No. I have seen some here at the lumberjocks site and in one of Roy Underhill’s books. I just purchased some 2×10s and 2×6s, planed them to a standard 1.25 inches thickness and did my best to produce a bench of that general style. The top and the one side apron are 2.5 inches thick. And the next step, a leg vise, maybe??? Thats a great, beastly looking bench. Until you get around to the vises, you might consider adding a jam-cleat and some dog holes to the front apron. 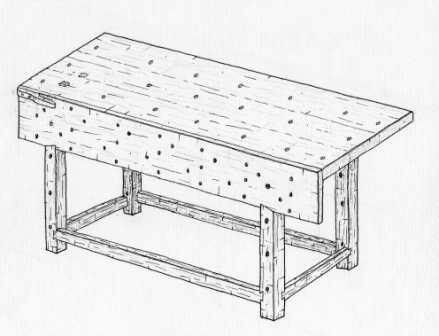 Then add a bench stop and some dog holes in the top. These are good features to have with or without vises. Used alone, or in conjunction with some F-clamps, a bench like that offers an infinite number of clamping options. Minimal cost and time. Tedstor, you read my mind. I ordered a 3/4 inch brad point bit (the local Rockler store only had a Chinese one and I refuse to buy that stuff if at all possible) and plan to place a series of holes in the front apron and in the top. I plan to make two simple jigs so they line up and are attractive. 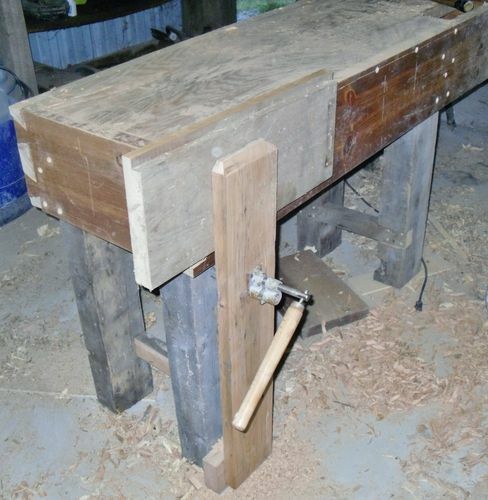 I love the simplicity of holdfasts and and can use bench dogs once the end vise is installed. I plan on using a Lake Erie Leg Vise and Veritas twin screw on the one end. They will be added in time. Thanks for the friendly comment. That looks rock solid. I like your idea on the rubber feet. I look forward to seeing what you build on it. That’s a very nice bench, Tim. I like how you took that dimensional lumber and milled it to look very sharp. I’m sure it’ll last you a long time to come. And we’re all looking forward to more posts from you. PittsburghTim, I just ran across this post. I noticed the Lumberjocks wet site says you originally posted it 415 days ago. So, I’m wondering, how’s that bench working out? It looks like you used two layers of 2-by material for the top. How did you put the top together and, attach it to the base? Has the top stayed flat? Corpmule, I have since added an end vise and a leg vise. Overall, I am still extremely happy with its performance. It is rock-solid and yes, the top has stayed very flat. I picked up a pair of Gramercy holdfasts and made my own bench dogs. The dogs allow me to use the twin-screw end vise as a tail vise too. My only complaint about the twin-screw vise is that it takes a lot of turns to move. That being siad, the speed knob makes it ok to use. I have thought about adding some extra rows of dog holes to minimize the amount of movement needed when using it as a tail vise. The top is two rows of 2x southern yellow pine. Each row was edge-glued and doweled and the two resulting panels were then glued. together. The apron pieces overlap the bottom layer of the top and were glued and doweled to the top from the side. I have not experienced any warpage or cracks to date and it’s been through all seasons now. If you have any specific questions or would like some close-up pics, let me know.